Feb. 20, 2010 -- Mary Philbin was one of the top dramatic actresses of the silent film era, a favorite of fans, directors and her fellow actors, and considered the screen equal of her contemporaries Mary Pickford, Florence Lawrence and Lillian Gish. Off screen, her life story would make a perfect silent melodrama, full of early success and stardom, over-protective and controlling parents, bitter family strife, forbidden love and, ultimately, tragic loss. 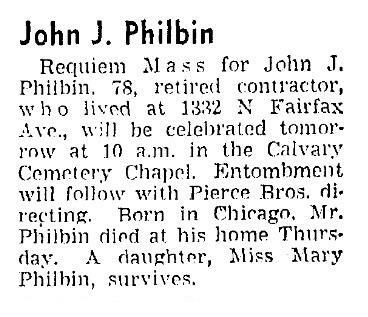 Philbin was born in Chicago on July 16, 1902, the only child of John Jacob and Blanche Philbin. (Many sources cite 1903 as the year of her birth, but her crypt marker lists 1902.) Her father, the son of Irish immigrants who worked as a conductor on the Chicago elevated trains, took his daughter to plays and sometimes even opera performances in Chicago, and she decided at a young age that she wanted a career in the theater. She took dance and music lessons, and one of her young friends was Rebecca "Carla" Laemmle, the niece of Universal Studios founder Carl Laemmle. When she was 16, Philbin heard that director Erich von Stroheim was coming to Chicago to search for new talent for his film, "Blind Husbands." Von Stroheim was impressed with Philbin's delicate beauty, and he selected her to come to Los Angeles and star in the film. Philbin's parents initially refused to give her permission to move to Los Angeles. But when they discovered that their family friends, the Laemmles, were moving to Los Angeles, they allowed Philbin to go, and they moved to L.A. with her, moving into a house at 1332 North Fairfax Ave. When she arrived in Los Angeles, Philbin discovered that she had been replaced in "Blind Husbands." With help from her friend Carla Laemmle, Philbin found work at Universal, and made her film debut in "The Blazing Trail" (1921). She appeared in five more films in 1921 -- "Danger Ahead," "Twelve Hours to Live," "Red Courage," "Sure Fire" and "False Kisses." As an actress, the 5-foot-2-inch Philbin was in the Mary Pickford mold -- sweet and innocent, her young face surrounded by thick, flowing curls of hair. In 1922, Philbin was named as one of the first group of "WAMPAS Baby Stars," an annual promotional campaign sponsored by the Western Association of Motion Picture Advertisers from 1922 to 1934 to identify 13 actresses the group believed were on the threshold of movie stardom. In future years, the WAMPAS Baby Stars would include Clara Bow (1924), June Marlowe (1925), Mary Astor (1926), Joan Crawford (1926), Dolores del Rio (1926), Janet Gaynor (1926), Fay Wray (1926), Lupe Velez (1928), Jean Arthur (1929), Loretta Young (1929), Joan Blondell (1931), Constance Cummings (1931), Ginger Rogers (1932) and Gloria Stuart (1932). Philbin also finally got her chance to work with von Stroheim, appearing in a small role in "Foolish Wives" (1922), which, at the time, was the most expensive production ever made at Universal. After appearing in five films in 1922, Philbin began to get larger roles, starring in "Merry-Go-Round" (1923), which was originally written and directed by von Stroheim, but he was fired before filming was completed. "Merry-Go-Round" turned Philbin into a genuine Hollywood star, with her picture beginning to appear on the covers of movie magazines. She also had starring roles in "Where is This West?" and "The Temple of Venus," both also released in 1923. 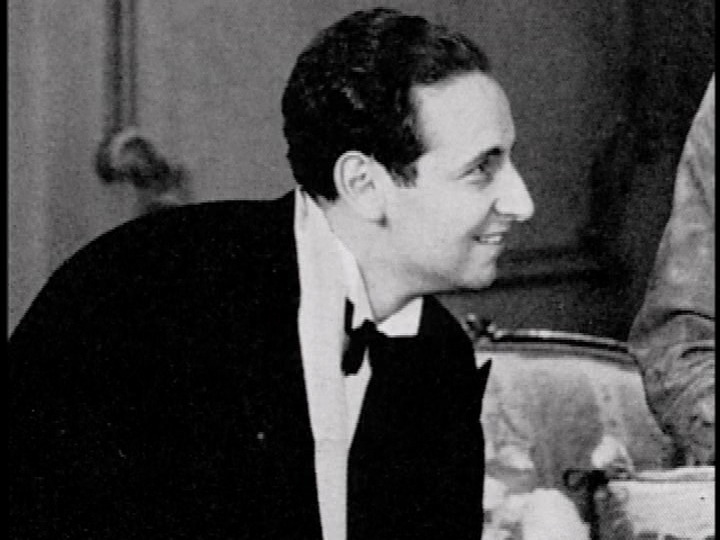 In 1924, Carl Laemmle selected Philbin for the role of opera singer Christine Daae, to co-star with Lon Chaney in "The Phantom of the Opera" (1925) -- which also featured Philbin's friend Carla Laemmle in a small role. At the time, Chaney was coming off his success as Quasimodo in "The Hunchback of Notre Dame" (1923) and was a major film star, and the naturally shy and reserved Philbin was somewhat nervous around him. Chaney and director Rupert Julian often clashed on the set of the film, often getting into heated arguments which would result in Chaney directing some of his own scenes. Philbin's big scene in the film is her climactic unmasking of the phantom in which she sees his horribly disfigured face for the first time -- a scene which caused movie audiences to jump in their seats and shriek in terror. The scene called for Philbin to be on the floor, screaming and crying after she pulls off the mask of the phantom, who remains off screen. After several takes, Julian wasn't satisfied with the scene, and he ordered an end to filming for the day. But Chaney asked Philbin and the crew to remain to film another take. Just as the camera started rolling, Chaney surprised Philbin -- and the crew -- when he launched a steady stream of vicious insults at the shy, young actress. Chaney raised his hand menacingly, and Philbin screamed, raised her hand to her face and began sobbing. As soon as the scene was caught on film, Chaney rushed over to Philbin and told her that he didn't mean any of the terrible things he said, and he was just trying to get an honest reaction from her to capture on film. Instead of being angry over the trick, Philbin forgave Chaney and had great respect for him as a performer. For the rest of the film, Chaney was always on the set when Julian was directing Philbin in a scene, even if Chaney was not in it. "The Phantom of the Opera" was a huge critical and commercial success, and Universal's biggest money-maker of the decade, and Philbin's star continued to rise. At about this time, Philbin met the man who would become the love of her live -- Universal Studios producer Paul Kohner. At first, Philbin and Kohner kept their relationship a secret, primarily due to their religious differences -- Philbin was an Irish Catholic, and Kohner was a Jewish immigrant from Austria-Hungary (now the Czech Republic). When they became engaged in May 1926, Philbin finally told her parents -- who immediately told her that if she married Kohner, she would be disowned. So Philbin broke off the engagement, and Kohner married actress Lupita Tovar in 1932. Philbin, however, never married and both Philbin and Kohner kept until their deaths the love letters they had written to each other. Philbin followed her performance in "Phantom" with starring roles in "Stella Maris" (1925); "Surrender" (1927); "The Last Performance" (1927), co-starring with Conrad Veidt; "Love Me and the World is Mine" (1927); "The Man Who Laughs" (1928), again co-starring with Veidt; "Drums of Love" (1928), co-starring with Lionel Barrymore; "Port of Dreams" (1929); and "After the Fog" (1929) -- her first and only talking picture, which is thought to be lost. Though Philbin was said to have a sweet, girlish voice, the early sound equipment recorded it as high-pitched and squeaky. "After the Fog" was her final film, although she did record her lines for the 1930 sound version of "The Phantom of the Opera." By the early 1930s, Philbin virtually disappeared from the public eye. She continued to live with her parents in their home on North Fairfax Avenue, between Fountain Avenue and Sunset Boulevard. 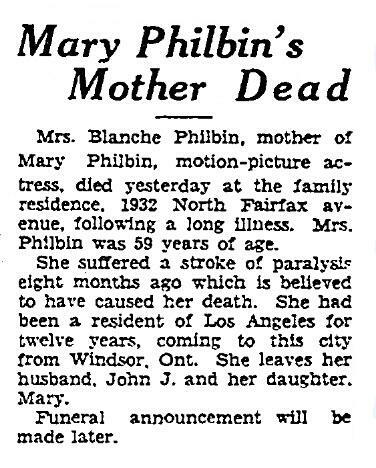 Philbin's mother, Blanche, died on Feb. 10, 1934, after suffering a stroke at the age of 59. Her father, John, died on May 7, 1948, at the age of 78. After her father's death, Philbin lived in the house alone. She left only to visit friends and attend church. She refused all requests for interviews -- although she was always friendly and accommodating to her fans. Her only public appearances were at a memorial service at Hollywood Memorial Park (now Hollywood Forever) for Rudolph Valentino in 1988, and at the opening of Andrew Lloyd Webber�s stage presentation of "The Phantom of the Opera," starring Michael Crawford, at the Ahmanson Theatre in Los Angeles, in May 1989. Mary Philbin died of pneumonia on May 7, 1993, in Huntington Beach, Calif., at the age of 90. She is buried at Calvary Cemetery in Los Angeles, next to her father.